Tomorrow is Christmas Eve and we are enjoying reading through the wonderful notes and cards from family and friends- many whom we have met in our gallery. 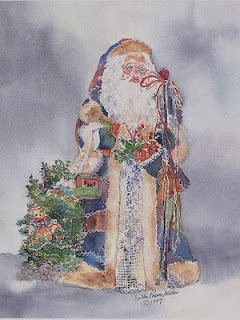 It is so much fun to recall our connections with all of you. .
Pictured here - The original "Father Christmas" watercolor which is currently hanging in our dining room. After New Year's we will move the jolly old man back to his off season home on the wall of our second bedroom. 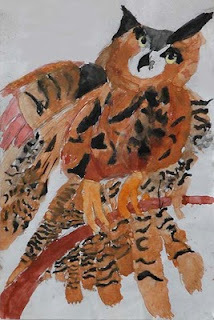 We have prints and note cards of him on our web site - in the "Christmas series". Overcome by the Christmas spirit, this evening I mixed up the dough for "peanut butter swirls" and put it in the fridge to chill overnight. Tomorrow, I will roll out the dough and spread melted chocolate chips over the top, then roll it up and chill it again. And about 30 minutes later, I will slice the roll into cookies, and bake them. These cookies are family favorites. The peanut butter cookies have been baked and are tucked into bags in our basement freezer, where they are a lesser temptation than in our kitchen cookie jar. (This is more preparation for my grandson's anticipated arrival). Studio Update: Web sales have gone smoothly through this holiday season. We've been able to send orders out promptly and even figured out how to handle a duplicate order from the same household - we called the second purchaser and were able to cancel one of the items, - that saved a buyer from needing to return a print. And we remind you - while we do not offer framed prints on our web site, do call us if you would prefer one framed, and if possible, we will try to accommodate you. Just ask - Our motto is to try to please. Over the next several days I will be working on a painting for my grandson Michael of a wooded scene in Germany (from a photograph he sent to me when he was studying there) Hope to have it finished before he and Kathryn get here. I'll take a picture of it and show you both the painting and the original photo. The large and complicated watercolor I told you about in my last blog has not yet been picked up, so it will be shown to you later. I'm just starting on another commission and am going to photograph it at different stages, so you can get an idea of how a watercolor.develops.